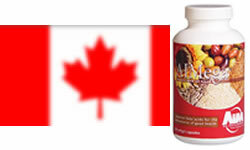 We are independent distributors of AIM Canada. The AIM International product line offers the highest quality food & juicing concentrates, herbal supplements and health products available on the market. The products listed on this page are available for sale to our Canadian customers. All prices are shown in CAD$ and are exclusive of GST and shipping charges. All orders shipped to Canada are invoiced at the CAD$ prices shown below. AIMega is a superior blend of omega-3,-6, and -9 in a convenient soft gel capsule. The best tasting, all natural, green barley juice on the market today—AIM BarleyLife® Xtra. Combines CoQ10 with tocotrienols and fish oil to provide cardiovascular support. Combines vanadium, gymnema sylvestre, bitter melon and chromium to maintain healthy blood sugar levels. A combination of the soluble fiber psyllium and cleansing herbs - helps maintain bowel regularity and other benefits. New formula: without cascara sagrada and licorice. Carrot concentrate provides a convenient way to achieve an improved diet with natural beta carotene. Powerful antioxidant, promotes heart health, enhances circulation and supports healthy cholesterol levels. The saw palmetto in ReAssure® SP is extracted from the berry and provides 85% fatty acids as well as phytosterols.